What could a tire company possibly know about good food? Quite a lot, it turns out. Earning a Michelin star (or two, or three) is a coveted seal of approval for restaurants worldwide. Foodies travel the globe collecting meals at Michelin-starred restaurants like they’re souvenirs. Just how did a French brand of car tires come to be one of the world’s most trusted food experts? In 1889 two brothers in Clermont-Ferrand, France formed the Michelin tire company. But demand for tires was low. 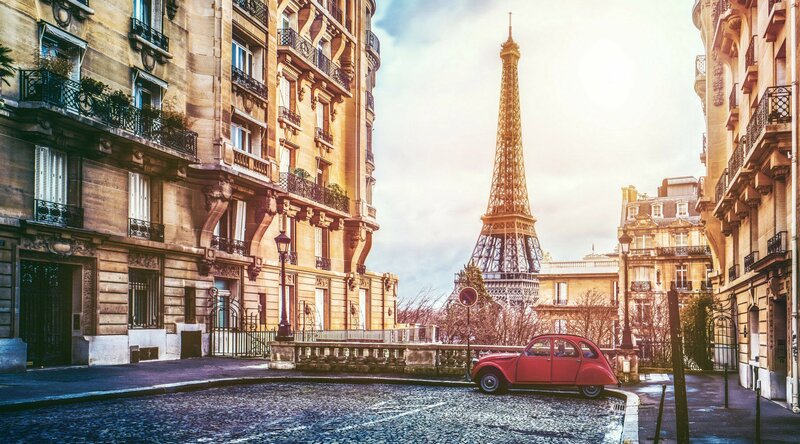 In 1900, there were fewer than 3,000 cars on the roads of France. So the brothers published a free guide to encourage car travel. The first Michelin Guide featured maps, listings for hotels, car mechanics, and gasoline vendors, and information on how to change a car tire. Over the next couple decades, the brothers expanded their guides to other countries and introduced an English language version. In the 1920s, the Michelin Guide of today began to take shape. The brothers began to sell the guide, rather than offer it as a free publication. They began listing restaurants by category and invested in hiring anonymous restaurant reviewers. In 1926 they debuted a star-rating system for fine dining. Originally, the Michelin Guide only doled out single stars to restaurants. But over time, a more complex rating system developed. In 1936, they published the official rating criteria. Over the past several decades, the Michelin Guide has continued to evolve. New countries are added—the first American guide, focused on New York City, was published in 2005 and a Hong Kong/Macau addition was published in 2008. In 2016, Michelin awarded two street food vendors stars for the first time in their Singapore guide. And there you have it. In an effort to convince more people to drive, thus purchasing tires, the Michelin brothers developed a rating system that would tell readers whether a food experience was worth traveling for. Today, foodies do more than just drive a couple hours to eat at a Michelin-starred restaurant. They put their names on waitlists. They fly across the world. They cruise to exciting locales. Unlike many restaurant guides (think Zagat, Yelp, or even TripAdvisor), consumer feedback doesn’t factor into Michelin’s star ratings. Only official Michelin reviewers—or, inspectors, as they’re usually called—determine whether restaurants receive stars. The exact scoring system is kept a secret. Like any good food critic, anonymity is key for Michelin inspectors. The criteria for earning Michelin stars are based solely on the food, rather than décor, ambiance, or service. Consistency is king when it comes to Michelin stars. To earn a star, a restaurant can’t simply offer a fantastic meal once. They should be able to deliver the same result on a regular basis. So Michelin inspectors will visit restaurants several times before awarding a star. Most Michelin inspectors are former chefs or have some other culinary background. They eat a minimum of 275 restaurant meals each year, traveling three weeks out of every month and dining out twice per day. For most chefs and restaurateurs, a Michelin star (or three) is an utmost desire. But some chefs have rejected the status symbol. Recently, Michelin announced the 2018 star ratings for France. Two new restaurants achieved the lofty 3-star rating, but one mainstay was notably absent from the list. Le Suquet à Laguiole had maintained its 3-star rating for 18 years. But this year, chef Chef Sébastien Bras requested that Michelin revoke the restaurant’s stars. He told Eater that he was tired of the pressure and limitations that came with the Michelin rating, and was eager to try new concepts without considering the implications to the restaurant’s Michelin rating. Such an outright request to revoke Michelin stars is new, but other chefs have retired or rebranded restaurants in the past—when this happens, Michelin will remove stars. Do you love French cuisine? Explore voyages to the French Riviera here. For most chefs, working at a Michelin-starred restaurant is the ultimate learning experience. Our own Executive Chef Robert van Rijsbergen, built his career working under Michelin-starred chefs before joining Azamara Club Cruises. Michelin now offers guides for four U.S. cities: New York City, Chicago, San Francisco, and Washington D.C. In South America, they offer guides for Rio de Janeiro and Sao Paulo. In Asia, Michelin publishes guides for six locations: Bangkok, Hong Kong/Macau, Japan, Seoul, Shanghai, and Singapore. The French company’s presence in Europe remains the most robust, with guides published for more than 20 countries. Although the Michelin Guide is popular and widely considered to be a gold standard for restaurants, it’s also not without controversy. A frequent criticism of the Michelin Guide is that inspectors show a preference for French cuisine. Yet another criticism is that Michelin was too easy on Japanese restaurants, perhaps in an attempt to break into the Japanese tire market. Indeed, in 2017 Japan led the global foodie race with 28 Michelin 3-star restaurants, just barely ahead of France’s 27. The United States comes in a distant third with 14, while Germany boasts 11, China ten, Italy and Spain each with nine, and the United Kingdom with five. If you love Japanese cuisine, you’ll love these 2019 voyages that call almost exclusively on Japanese ports. Japan and France aren’t the only Michelin star powerhouses, though. Sometimes, small cities or towns host several Michelin-starred restaurants within their borders. When it comes to fine dining, Belgium is small but mighty. The tiny country boasts the highest density of Michelin-starred restaurants in Europe. To experience the best Michelin-starred meals of Belgium for yourself, consider cruising to Bruges and Antwerp. In Scandinavia, Denmark is beloved by Michelin inspectors with 28 stars among 24 restaurants. Copenhagen is home to one 3-star restaurant, one 2-star restaurant, and 13 1-star restaurants. The smaller, charming city of Aarhus, Denmark boasts three Michelin-starred restaurants. Singapore’s claim to fame isn’t the city’s sheer number of Michelin stars, but the value. In 2016, two hawker food stalls made international news when they were awarded Michelin stars. Hong Kong Soya Sauce Chicken Rice And Noodle’s signature chicken rice dish is now known to be the world’s cheapest Michelin-star meal at approximately $1.85 USD. We couldn’t agree more. The restaurant is perched high above the sparkling azure Marina Del Cantone Bay, which makes for a stunning backdrop for a wine and cheese tasting. But Quattro Passi’s real claim to fame is its unique wine cellar. It’s dug directly out of the tufa rock and houses no fewer than 15,000 bottles of wine. What’s next for the Michelin Guide? As the global food scene expands and evolves, the Michelin Guide must adapt to keep pace. You’re likely to see more stars doled out to places like food stalls in Singapore and perhaps less of a focus on French cuisine—especially in destinations outside of France itself. Is visiting a particular destination or restaurant on your bucket list? Find a voyage there.